Ginger, if you have not already surmised, is one of my favorite spices to add to things. It lends brightness, bite, and depth to savoury recipes like chicken noodle soup, and blends beautifully with fruits like pears and peaches. 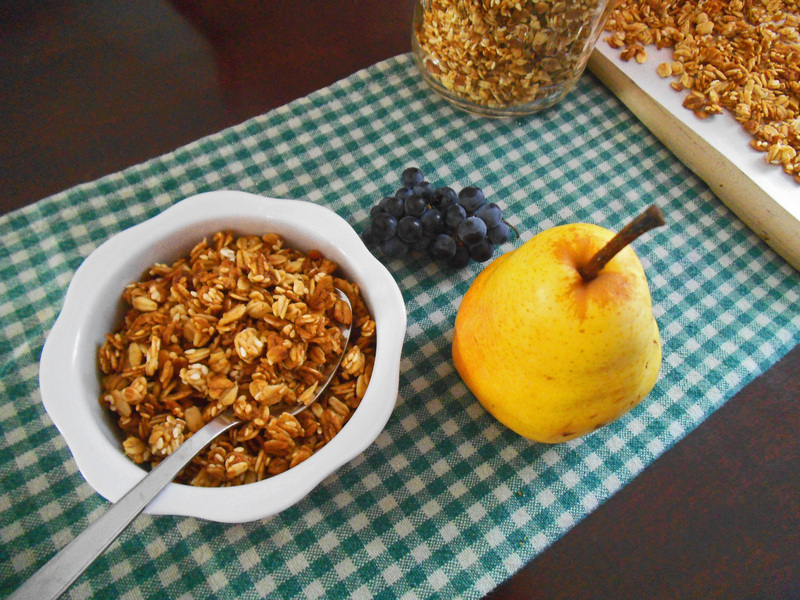 The notion to add pears to my granola came along before I saw Sally’s granola recipe, but it served as a springboard from which to create this one. Looking at the other ingredients, you may notice that I added sesame seeds. Rich in nutrients like calcium, magnesium and vitamin B1, sesame seeds also pair very well with ginger. You could certainly substitute another dry ingredient like quinoa or flax seed if you prefer. That’s the beauty of granola–you can tweak it indefinitely, depending on your mood, taste, and what’s in the pantry. 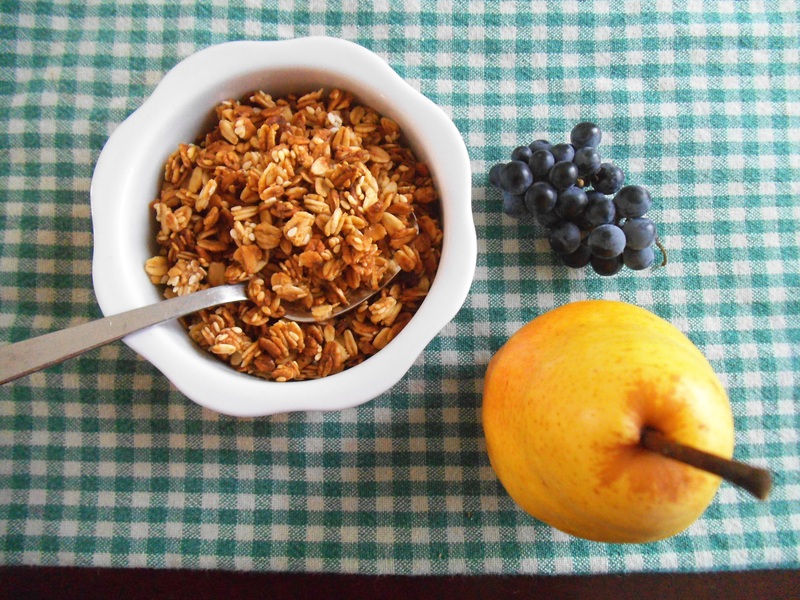 Though I did not grown up eating homemade granola, it is a treat that evokes good memories. I remember enjoying bowls of granola that came right from the oven for breakfast with my good friend in high school. We also enjoyed homemade granola when we visited my grandparents. Each family makes their granola a little differently, and I love the variety. For the holidays, I would like to make granola samplers to give away as gifts. The idea of granola as a gift was something I latched onto last year, thought I still have to put it into action. It would be the perfect opportunity to make Carrot Spice Granola again too. The main feat will be baking enough to give away; once made, granola disappears rather quickly around here! Preheat oven to 325 degrees F (165 C). In one bowl, combine oats, sea salt, ginger and cinnamon. In a separate bowl, mix together sesame seeds, pear puree, oil, maple syrup, and brown sugar. Combine wet and dry ingredients and stir until evenly incorporated. Prepare 2 baking stones or trays by lining them with parchment or silicone mats. Spread granola evenly between the two trays. 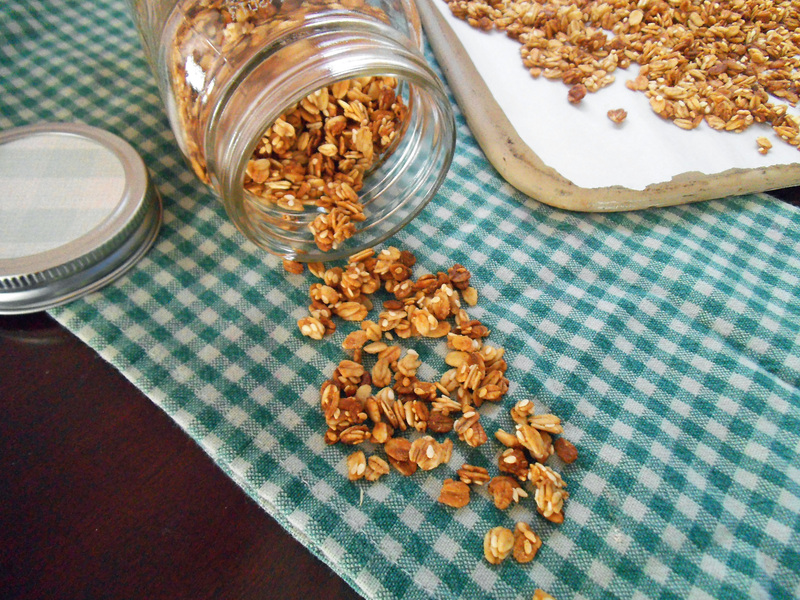 Bake granola for about 40 minutes, stirring every 15 minutes or so, to ensure even toasting. 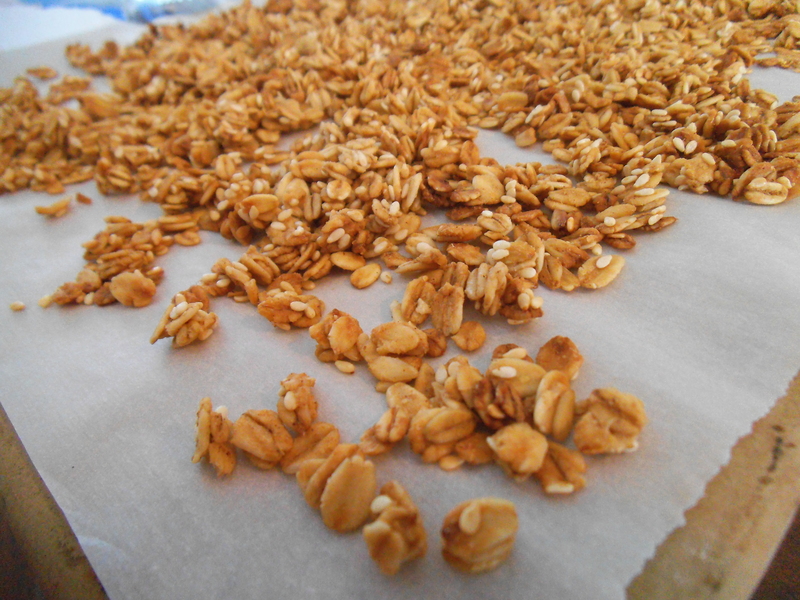 Take trays of granola out of the oven and let the granola cool on the trays until it is crispy. Store cooled granola in an airtight container (I prefer Mason jars). Tip: Though not essential, using a baking stone gives especially nice, even results. Insulated baking sheets should give a comparable performance. I’m sharing this recipe at Traditional Tuesdays, Allergy Free Wednesday, and Pennywise Platter.